The world-famous Foothills Trail traverses some of the most beautiful, and rugged, terrain in our state, but getting on the trail is easier than you might think. A part from the rhythmic "shu, shu, shu," of hiking boots on a thick carpet of fall leaves, it's quiet on this middle section of the Foothills Trail. Lake Jocassee shimmers in the distance, embraced by hills covered in a patchwork of autumn colors. The ghostly skeletons of mighty hemlocks, denuded by the invasive hemlock wooly adelgid, pose a stark contrast to the vibrant fall display, strangely beautiful in their own way. The leaves underfoot give up a pleasant, nutty smell, albeit one occasionally overpowered by the pungent, sour-socks odor of galax (aka skunkweed) floating up from underneath the mountain laurel bushes lining the path. It's a pleasant seventy degrees, feeling more like spring than late fall on this stunning November afternoon in the Upstate of South Carolina, and I'm on a "moderate" (5.5-miles) hike led by Master Naturalist Steve Marlow offered to participants at the thirty-eighth meeting of the Foothills Trail Conference(FTC). 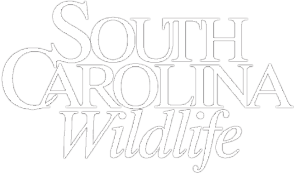 FTC members travel from across South Carolina and beyond to attend lectures and presentations, share meals, participate in trail clean up and maintenance activities, and explore some of the seventy-six-plus miles that make up the Foothills Trail during this annual gathering. Among those on today's hike are eighty-one-year-old Jean Arthur and her husband Don, longtime FTC members who call themselves "The Meanderthals." The couple has traversed the entire Foothills Trail sixteen times (more than 1,000 miles), accompanied by several other "well-seasoned" hikers. The group's brisk pace belies their collective age. As they walk, they talk amongst themselves, reminiscing about past hikes. All have earned the Peregrine Award, presented to FTC members who hike the entire length of the trail. 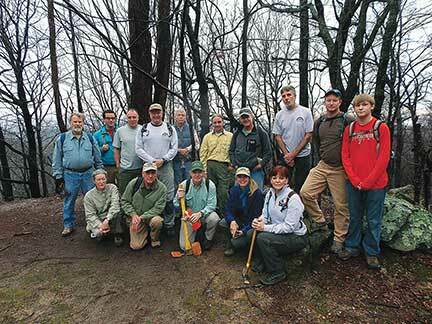 Tonita Thompson, a comparative youngster in the group, recently hiked sixty miles of the trail to celebrate her sixtieth birthday and enjoys the camaraderie she finds among her fellow hikers. "Outdoors people are just the nicest people," she says. The Foothills Trail winds through a scenic and diverse landscape - deep mountain hollows rarely visited by the sun; ridges offering stunning views of the Blue Ridge Mountains; sun-flecked glens that look like they should harbor hobbits; rushing streams that cascade over rocks and transform into waterfalls. Wildlife, including bears, deer, turkey, hawks, eagles, woodpeckers and a plethora of other birds, abound. 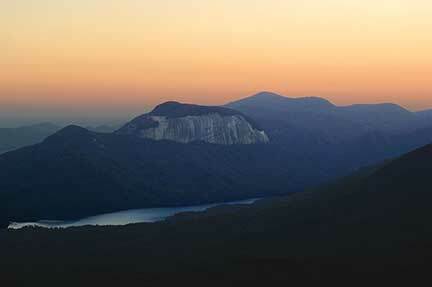 The trail's eastern end is anchored by Table Rock State Park. 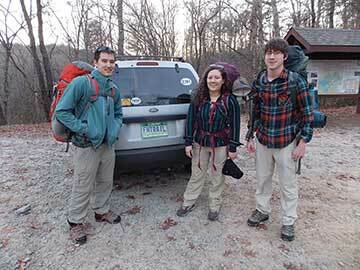 The western-most section winds along 8.5 miles of the Wild and Scenic Chattooga River. In between lies Sassafras Mountain (South Carolina's highest peak at 3,553 feet); the untamed wilderness of the S.C. Department of Natural Resources-managed Jim Timmerman Natural Resources Area at Jocasssee Gorges (recently named one of the fifty "Last Great Places" by National Geographic magazine); and much, much more. The trail is an amateur botanist's paradise, where observant hikers might see everything from common - but beautiful - plants such as Jack in the pulpit to fern species that grow nowhere else in North America or the rare Oconee bell, endemic only to the cool, damp recesses of the Gorges. Explaining the origins of the trail is - as the FTC-published Guide to the Foothills Trail puts it - a bit like trying to describe how the root system of an ancient oak tree results in the limbs and branches that we see. Some of the many paths that were joined together to create the Foothills Trail have been around since prehistoric times. In an acorn shell, the modern Foothills Trail has its roots in the 1960s, when a group of Upstate hiking enthusiasts joined forces in an effort to gather public support for connecting and improving a series of mostly unmarked trails running throughout the Blue Ridge escarpment. 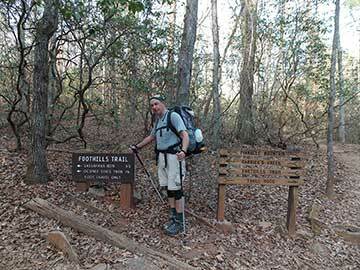 That group set as their goal creating a system of well-marked, accessible trails with a "backbone" that would eventually become the main route - approximately seventy-six miles linking Oconee and Table Rock state parks, with trailheads at various points along the way. Some of those early planners and activists included Clemson University professor Gordon Howard Parks, an instructor in the school's Recreation and Tourism Management program, and original FTC chairman Glenn Hilliard. The project's success "would not have been possible without the agencies, landowners and volunteers who made the Foothills Trail one of the best hiking trails in the country," says Hilliard, and the cooperative spirit between Duke Energy; the U.S. Forest Service; South Carolina's state Parks Department; the Sierra Club; and many citizen activists and volunteers. All involved were dedicated to the idea of increasing public access to the area's natural beauty, and their hard work and enthusiasm were rewarded when the main trail was completed in the early 1980s. 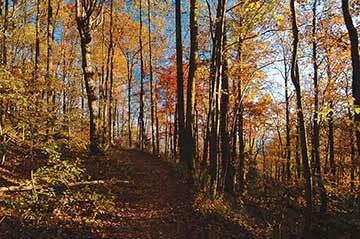 In its current iteration, the Foothills Trail includes more than thirty miles of spur trails connected to that initial seventy-six miles; routes that lead to waterfalls, overlooks and other areas of interest, including the popular spur that connects Sassafras Mountain with Raven Cliff Falls and the overlook at Caesars Head State Park. FTC Executive Director Heyward Douglass estimates that thousands of people use the trail annually, starting at a dozen access points that lead to sections ranging from "easy" to "strenuous" and cover from one-and-a-half to more than sixteen miles. These varied sections and multiple access points allow the Foothills Trail to offer something for hikers of every skill level. 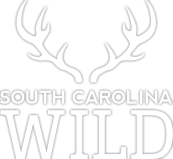 "It goes through some of the most beautiful territory in South Carolina," says Douglass, who runs shuttles for hikers who want to get dropped off and/or picked up. "You have to experience it to fully appreciate it," he continues, "until then it's just a line on a map that doesn't give you any idea how truly beautiful it is." 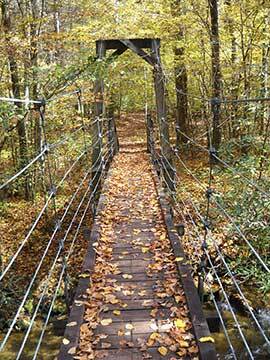 Douglass calls it the "jewel in the crown" of the Blue Ridge Mountains. FTC members and other volunteer groups "produce a lot of sweat" to help maintain the trail, he adds. Troops of Boy Scouts and Girl Scouts have built bridges and benches, for instance, and the FTC is always looking for ways to partner with groups or individuals to help support its mission. 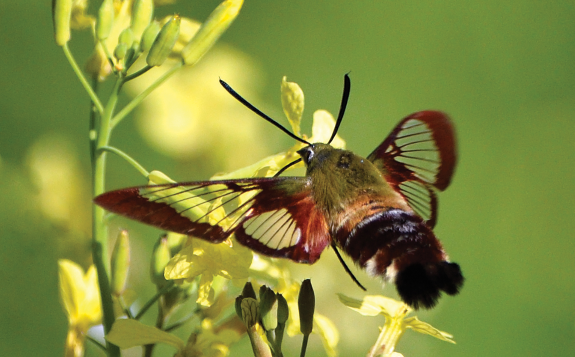 Duke Energy, the S. C. Department of Natural Resources and the U.S. Forest Service, as well as students from Clemson University and Furman University, have all contributed in different ways. 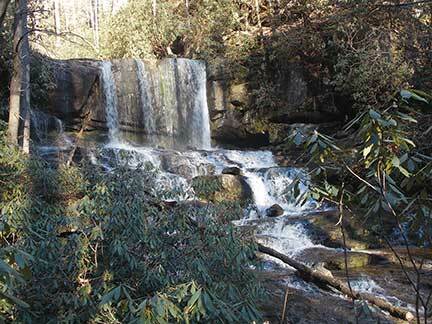 Not only does the Foothills Trail offer a superior hiking experience (Backpacker magazine rated it as "one of the best long trails [fifty plus miles] in the country"), it also provides access to some spectacular waterfalls for sightseers and photographers. Hikers on the western end of the trail can enjoy sweeping views of the Chattooga River and find opportunities to fish, swim and float. 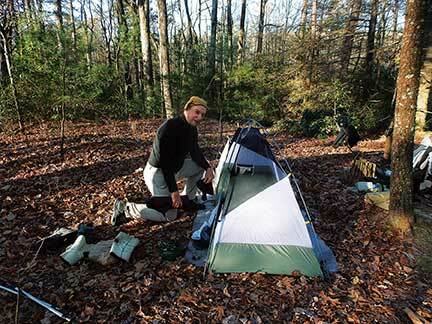 Camping is allowed at various spots along the trail, birders will find plenty of avian activity, and botanists will rejoice at the diversity of plant life. Every season on the trail has its appeal. Spring offers the chance to experience the rebirth of nature, as trees shoot out tender green buds and birds compete ostentatiously for mates and territory. In the sweltering Southern summer, a refreshing swim in a cold mountain river makes a hot hike worth the effort. Fall bittersweetly reveals that death can be beautiful, as leaves turn from green to red, yellow and orange before letting go to join generations of their brethren. Finally, the gentle Southern winter is a curtain parted to reveal stunning views of the Blue Ridge escarpment, Lake Jocassee and outcroppings of giant rocks that have hurled themselves from the mountainsides to rest among the trees. 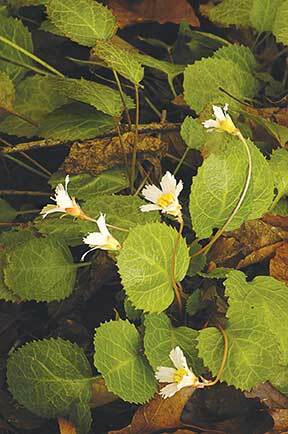 Winter hiking also offers respite from summer's biting insects. 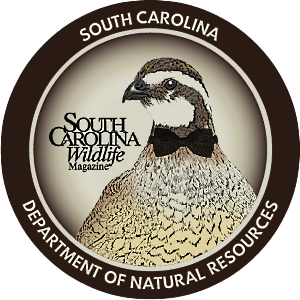 Whatever time of year you go, get out there and make the most of this South Carolina treasure. Before venturing onto the trail, remember that risk is inherent in any outdoor activity, and hiking the trail is no exception. Be prepared. Take plenty of water, especially in hot weather, and layers of clothing, especially when the weather is cool. Dark comes quickly in the mountains, so unless you are prepared to camp overnight, be sure and allow enough time to get to a trailhead before sundown. Hunting is allowed seasonally in areas surrounding the Foothills Trail, so stick to marked trails and consider wearing bright clothing during the hunting season. Don't climb on the rocks, wade or swim above waterfalls. Always let someone know where you're going and approximately when you'll return. 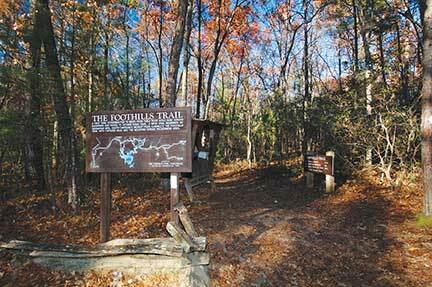 The FTC-published Guide to the Foothills Trail, available directly from the FTC or at many outfitters, is the best source for maps, historical and natural data and other helpful information, such as how to plan an outing and what to take along. Visit https://foothillstrail.org/ to order a copy and find out how to become an FTC member. Greenville-based freelance writer Laura Garren is currently at work on a book about the natural history of the Chattooga River.